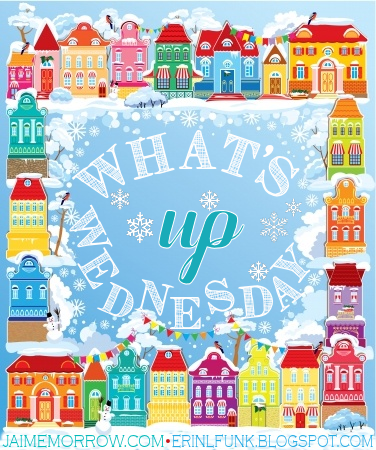 What’s Up Wednesday: Let’s kick off 2015! My Book Club met last night and I struggled through JANE EYRE this month. Actually, I read through about half of it and then watched the movie on Netflix. 🙂 Is that really how people spoke back in the day? Just get to the point, already!! I just couldn’t stick with it. But I’m glad I tried. One of the best things about belonging to a book club is that it pushes me to read stuff that I would never pick up on my own. The next book club choice is AMERICAN SNIPER. Hm… that’s definitely one I would never pick up on my own! I also read BRIGHT COIN MOON by Kirsten Lopresti last week. It was really a great read. There is some gorgeous language, complex relationships, scams a-plenty, a house fire, a crazy mother and a horribly conflicted MC. Here is the synopsis from Goodreads: Set against the colorful backdrop of immoral psychics and dishonest scam artists, Bright Coin Moon tells a story of longing and loyalty and the emotional burden of sacrifice. I’m starting next on LEGEND by Marie Lu. It’s been on my TBR list forever. Still plodding along through revisions on THE WITCH OF HIGHLAND FALLS although, to be completely honest, I haven’t written or revised much of anything through the holidays. The goal this week is to spend two hours on revisions at least four days over the next week. Turning off EVERYTHING except Pandora. Through all the hubbub of the holidays and the kids being home from school, I have really lost my groove (well, if I ever really had a “groove”) and I have forgotten that this is a key component for me: turn it ALL OFF. I am also planning to trial the Freedom app sometime in the near future. I’ve heard lots of great things about it. Are you a Freedom user? Any thoughts? Not a whole lot. We’ve been dealing with bone-chilling cold in Minnesota for the last few days (although, I think that’s the case for a lot of the country). So we spend our days just trying to stay warm! The wind chill is so cold out there this morning that school is two hours late. The high temp today is supposed to be around -4 with a wind chill of about -30. I’m also working on getting back into “the groove” at work after holiday time off. 20 Responses to What’s Up Wednesday: Let’s kick off 2015! Thanks! I have been trying to go easy on myself about the lack of progress over the holidays. 🙂 Thanks for stopping by and have a wonderful week! Best of luck with those revisions! I really need to work on turning the internet OFF when writing – I’m so easily distracted! Thanks Emma! Yes, the internet is the biggest culprit. I saw a cartoon the other day of a guy saying to his boss, “Don’t worry, this project will get done just as soon as there’s nothing interesting on the internet.” Lol – so true! Have a great week! I didn’t do any writing over the holidays either. It’s just way too distracting and whatever discipline I normally have (spoiler alert: next to none) was completely non-existent. Here’s hoping we can both get back to some kind of routine! Have a great week, Kitty! Hi Jaime – I know, I definitely don’t have the biggest claim on cold weather! Colder than Mars, though – wowzer! I guess I don’t have it so bad. Good luck to you getting back into your routine, too. Have a fantastic week! Thanks for the shout-out, Kitty! I’m so glad you enjoyed it. School was delayed here, too, but we have snow. Hope it warms up soon! No thanks necessary – I really, truly enjoyed the book and I love telling people about books I enjoy! I hope you have great success with it. And here’s hoping it warms up all over the place. I am to the point where I feel like I can’t warm up even when I’m hunkered down under the covers at night. Have a great week! We are supposed to have a high temp of 3 degrees here in Kansas City today! BRRRRR! Stay warm up there! Brrrrrr right back at ya! We are in the same boat. The same, icy, icy boat. 🙂 Misery loves company? Wishing you warmth as well! I’ve never been much of a Bronte fan (either sister) although I love Jane Austen and the language isn’t much different. Good luck getting back into your groove- I’m trying to do the same after the holidays. This was the first time I had tried to read Bronte (either one) and … um… I think I’ll have to stick to the movie adaptations! Good luck to you, too, in getting back into the groove! Brrrrrr, that sounds SO COLD! Hope you can keep warm while you work on those revisions. Sadly, we all seem to be looking forward to tomorrow when it’s supposed to get all the way up to 14! How twisted is it when 14 seems warm?! Argh! Happy New Year to you, too, and have a great week! Today we have gone from the deep freeze to crazy, windy, blizzard conditions! Just to change it up, I guess. 🙂 Glad my “commute” to the day job is about five blocks and I’m home now for the evening. Time to hunker down! I need to try turning off everything. I just don’t understand how it is done. There are too many things, and something is bound to slip through the cracks. And the kids…they will find it! Have an awesome week! I know, it’s bad because even if I use Freedom and block myself from internet on my computer, what’s to stop me from picking up my phone or my Kindle?! I might have to actually use self-control! *gasp* Have a great week, Melanie! And holy crap that’s cold!!! I thought it was chilly here this morning…and then I read that! Please don’t freeze to death. I feel like I should say “Stay alive…I will find you!” at this point in a very dramatic movie voice. Just pretend I did. And oooh, Bright Coin Moon sounds right up my alley. I might have to drag it on vacation with me. I would also like to drag you on vacation because of the whole not freezing to death plan. Why don’t teleporters exist yet? It’s 2015 already. I should be able to teleport fantastic writer types to the beach at will.